Preheat oven to 350.In a medium-sized bowl, combine the flours, baking soda, baking powder, cinnamon, and salt. Set aside.Pulse the avocado in a food processor until smooth. Meanwhile, cream the butter in a large bowl. Add the avocado to the butter, and beat on high for 2-3 minutes. At first it will look lumpy, but eventually it will be whipped and smooth. Beat in the peanut butter, then add the Sucanat, mixing until smooth. Pour in the flax eggs and vanilla, mixing until combined.Gradually add the dry ingredients to the wet ingredients, using a spatula to wipe down the sides frequently. 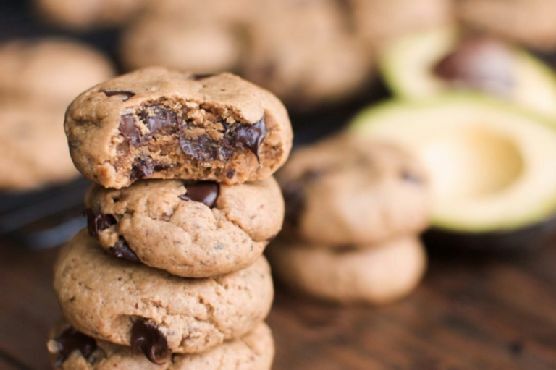 Fold in the chocolate chips.Use a heaping tablespoon to scoop the batter, then roll into balls and place on a greased/parchment-lined cookie sheet. Press down lightly with your fingers on each cookie, flattening out slightly. Bake for 9 minutes. After removing from the oven, let the cookies sit on the baking sheet for a couple of minutes before moving them to a cooling rack. Cookies works really well with Cream Sherry, Madeira, and Prosecco. Sweet bubbly Prosecco doesn't overwhelm simple sugar or shortbread cookies, a sweet cream sherry complements spiced cookies, and madeira's nutty notes match cookies with nuts perfectly.